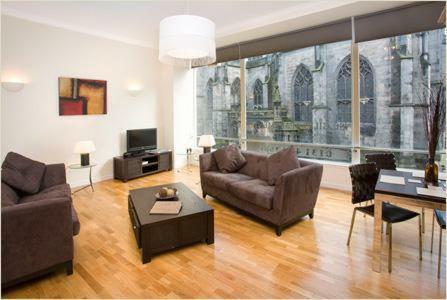 In the historic centre of Edinburgh, the elegant Advocates Apartments offer spacious accommodation on the Royal Mile. The 4-star apartments feature full self-catering facilities. Each of the contemporary apartments is stylishly decorated with hardwood floors and modern furnishings. The apartments have large, open-plan kitchens and ample dining space. Each apartment has a separate soundproofed bedroom, and a modern bathroom. Each one is individually styled, and some feature a spa tub and impressive city views. All have Wi-Fi, and public parking is available nearby. A selection of bars and restaurants is found just a few steps away, and Edinburgh’s historic castle is a 10-minute walk from the property. Edinburgh Waverley Rail Station is a 5-minute walk away, and popular Princes Street is just half a mile from the property.